Every day before work, Kevin Lau stopped for breakfast at a restaurant in Sai Wan Ho, a residential area in eastern Hong Kong. It was a routine as ingrained in him as brushing his teeth, and it nearly cost him his life. On a morning in February 2014, Lau — a senior editor at the popular, upmarket daily Ming Pao — had parked his car on a street near the restaurant when two men, wearing motorcycle helmets and gloves, rushed up to him. One slashed at Lau with a meat cleaver, knocking him to the floor, where he lay bleeding with deep wounds in his back and legs as his assailants ran off. With what a court later described as “superhuman calm,” Lau phoned for an ambulance, and was rushed to hospital. He survived, and two men with triad links — Yip Kim-wah and Wong Chi-wah — were arrested and charged with grievous bodily harm. While Yip and Wong were later jailed, they did not reveal who had commissioned and paid for the attack, one of several against journalists in Hong Kong at that time, including the firebombing of the home and office of Jimmy Lai, publisher of the Apple Daily, a tabloid highly critical of the Chinese government. 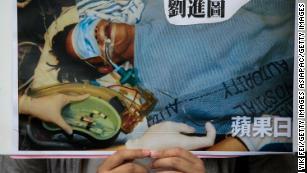 A protester holds a sign showing Ming Pao editor Kevin Lau in hospital after he was attacked in 2014. In the wake of the attack against Lau, several thousand journalists and supporters took to the streets, dressed in black and carrying banners which read “They Can’t Kill Us All” in a defiant show of support for press freedom in the semi-autonomous Chinese city. 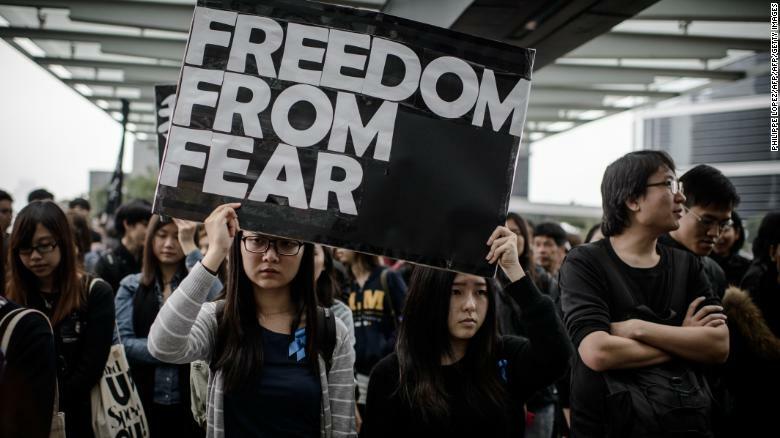 It was a tense period for journalists in Hong Kong. The sense of despair was lifted, temporarily, by the so-called Umbrella Revolution mass pro-democracy protests that broke out in late 2014. Those demonstrations saw the international media spotlight swing onto Hong Kong, and the local press rose to the challenge, covering every aspect of the protests and their fallout, and winning multiple awards in the process. Indeed, in the wake of the protests, reporters’ assessment of press freedom in the city rose for the first time in years, according to the Hong Kong Journalists Association (HKJA). But just as the Umbrella protests eventually gave way to widespread disillusionment, as hoped for reforms never panned out, and multiple prominent pro-democracy figures were jailed, recent weeks have seen a collapse in confidence among the city’s small journalist community, and renewed fears of self-censorship, prosecution and violence. On November 9 this year, the HKJA warned of the “death knell of freedom of speech” in the city. Protesters display placards during a rally to support press freedom in Hong Kong on March 2, 2014. Under Hong Kong’s de facto constitution, the Basic Law, residents are guaranteed “freedom of speech, of the press and of publication,” rights that are not granted, or protected in mainland China. While this means there is little top-down control of media in Hong Kong, self-censorship within the local press has been widely reported, both by front-line reporters and editors who have left publications they felt were unwilling to stand up to the government or corporate pressure. One of the best descriptions of self-censorship, and its pernicious power which sometimes outstrips that of more aggressive control, comes from China scholar Perry Link. “(The) government’s censorial authority in recent times has resembled not so much a man-eating tiger or fire-snorting dragon as a giant anaconda coiled in an overhead chandelier,” Link wrote about academic self-censorship in China. While mainland China has a massive formal censorship apparatus, controlling all aspects of society from movies and music, to the Internet and book publishing, much of what affects people on a day to day level is closer to self-censorship. Social media firms, for example, employ hundreds of censors to police what their users say, but for the most part, they do so without guidance or direction from the central government, second guessing what their bosses, and by extension the Communist Party’s official censors will disapprove of. In this context, self-censorship becomes more effective the more unclear the boundaries, and the greater the repercussions for potentially stepping across them. This could be seen in Hong Kong in the wake of the attack on Lau, as the chance of a violent response to a story suddenly seemed a real possibility to many reporters, compounding existing fears about the “wrong” story costing the journalist their job or resulting in costly legal proceedings. For over a decade, however, even as warnings grew about self-censorship by Hong Kong reporters, and media ownership was consolidated by a few China-friendly businesspeople, the foreign press has largely operated unfettered, a stark contrast to China, where international reporters regularly harassed, ejected from the country, and their local colleagues arrested and jailed. 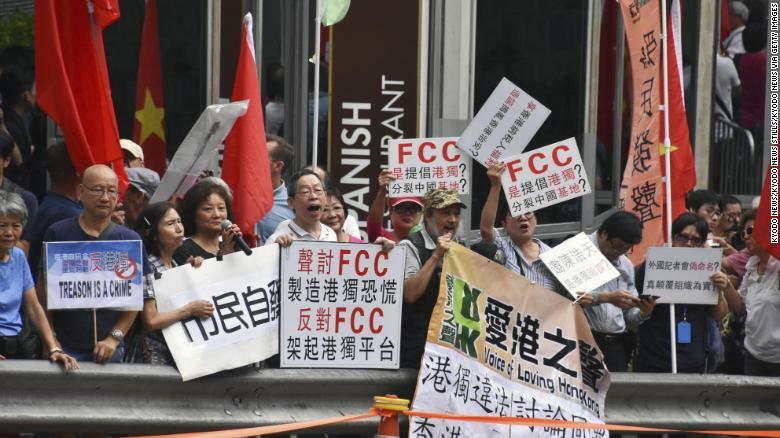 People raise pro-China signs in a protest against Hong Kong independence in front of the Foreign Correspondents’ Club in Hong Kong on August 14, 2018. The Foreign Correspondents’ Club of Hong Kong is positioned half way up a hill on a busy, windy road with narrow pavements and multiple lanes in the city’s Central district. Inside, the focus of the protests, Andy Chan, sat looking calm and composed as he prepared to give a speech arguing for the city’s independence. He chatted casually with FCC staff, and laughed when fire department officials rushed into the building carrying axes in response to an apparent hoax call. Within days of the event taking place, Chan’s Hong Kong National Party was officially banned under public security laws, the first time they had ever been used to go after a political organization. The FCC itself, meanwhile, was facing a storm of publicity amid calls for it to lose the lease to its property and potentially even its license to operate. 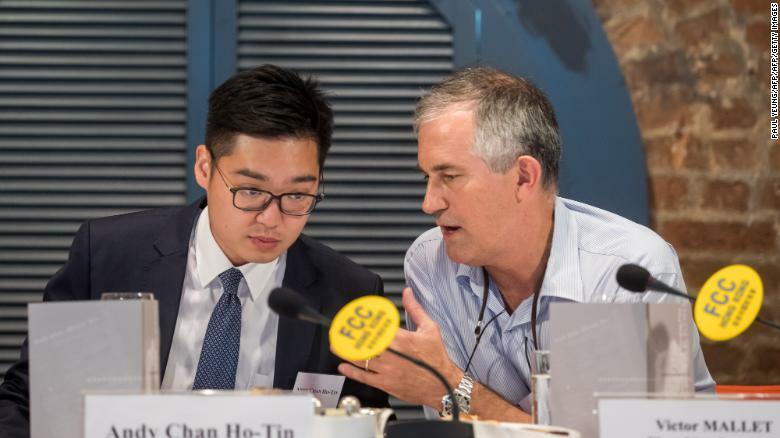 Victor Mallet, a Financial Times journalist and vice president of the Foreign Correspondents’ Club (FCC) (right) speaks with Andy Chan, founder of the Hong Kong National Party, during a luncheon at the FCC in Hong Kong. By October, those fears appeared misguided, until Victor Mallet, an editor at the Financial Times who had hosted Chan in his capacity as acting-FCC President, put in for a routine visa renewal. Compared to China and many other countries in the region (including ones which boast about being democracies), Hong Kong is an incredibly easy place to get a journalist visa, but Mallet had his refused, an almost unprecedented move the government has yet to explain but nearly everyone else has connected to the Chan talk. While the local government has consistently denied that Mallet’s ejection was anything to do with press freedom, the failure to provide an alternate explanation, as well as the facts of the case, have left most to draw their own conclusions. “We … are deeply concerned that with this action, taken with no stated or apparent legal basis, Hong Kong’s special place as a bastion of free expression and a free press has been eroded,” 17 former presidents of the FCC wrote in an open letter to Hong Kong leader Carrie Lam after Mallet was denied entry to the city as a visitor on November 8. While reporters working in mainland China are obviously subject to the pressures and concerns that can lead to self-censorship — fear of violence, fear of being ejected from the country or even jailed — there is an additional factor in Hong Kong, in that the city has long been a place where many expats, including foreign reporters, are more like immigrants, getting permanent residency and raising their children, rather than moving on after a few years. Being ejected from a country one never had any intention of living in can, though most journalists would not admit it, be a boon to career prospects, significantly building the reporter’s profile and reputation. But being forced to leave somewhere you intended to raise your family and settle down can be devastating, and questions naturally arise over whether any given story, or event, or interview, is worth that? Recent weeks have seen two incidents which appear from the outside to be clear cut cases of self-censorship. This was followed by the cancellation of a talk by another Chinese exile, novelist Ma Jian, at Tai Kwun, an art space which has received government funding, as part of a series of events connected to the Hong Kong International Literary Festival. “The cancellation appears to be at the very least an act of self-censorship, which would add to a growing list of incidents of suppression of free expression in Hong Kong,” said Jason Y. Ng, president of PEN Hong Kong, a pro-free speech organization. “It is all the more jarring that the decision was made by a publicly funded venue that claims to celebrate and support the arts and creativity,” added Ng. 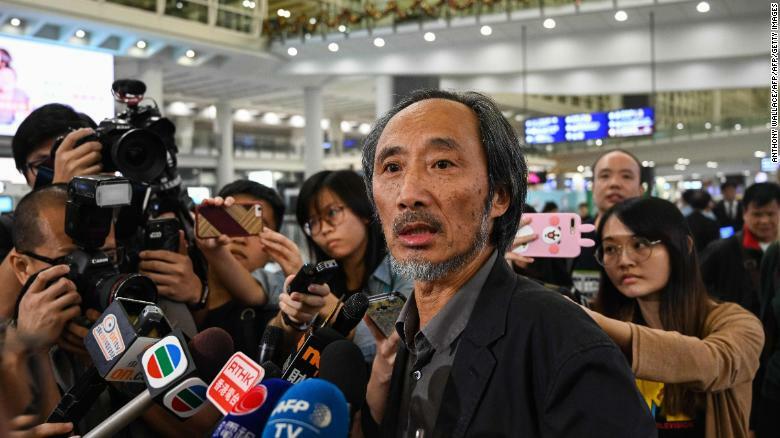 Chinese author Ma Jian speaks to the press upon his arrival at Hong Kong International Airport on November 9, 2018. The self-censorship charge appeared to be confirmed when Tai Kwun abruptly reversed its decision and agreed to host Ma after all. “Ma has made public statements which clarify that his appearances in Hong Kong are as a novelist and that he has no intention to use Tai Kwun as a platform to promote his personal political interests,” Calnin said in a statement. Over all of this — Mallet’s visa refusal, Badiucao’s cancelled show, Andy Chan’s banned party, and all the protests and demonstrations they inspired — hangs a long delayed anti-sedition provision contained within the Basic Law, the city’s de facto constitution. Attempts to implement the law in 2003 sparked massive street protests which eventually saw it shelved, but it has remained a priority of the central government and current leader Carrie Lam has vowed to create “suitable conditions” for passing the law, though she has not outlined any timetable. While the Hong Kong government has shown it is not lacking in powers to go after protesters or dampen expression, Article 23 would massively expand the amount of forbidden topics in a city already nervous about its freedoms, and possibly even end its role as a hub for international media in Asia. Speaking to reporters at the Tai Kwun event, Ma Jian said people nevertheless need to “have the courage to break” through self-censorship.